Councillor Doug Sanders speaks in council chambers, while Councillor John Shields looks on, when the first draft of the 2017 city budget was introduced. This first draft comes with a tax increase of 2.5 per cent. The numbers are in, and to go along with a budget that is keeping things status-quo for many city departments, Oshawa residents could soon be staring down the barrel of a 2.5 per cent increase to their taxes come 2017. Presented to council for the first time on Dec. 16, councillors learned that in order to keep things running smoothly throughout the city, an additional $3.176 million would be required, bringing the city’s operating budget to nearly $141 million. These additional dollars could lead to a 2.5 per cent increase for ratepayers, or approximately $55.52 on the average tax bill (for homes assessed at $350,000). 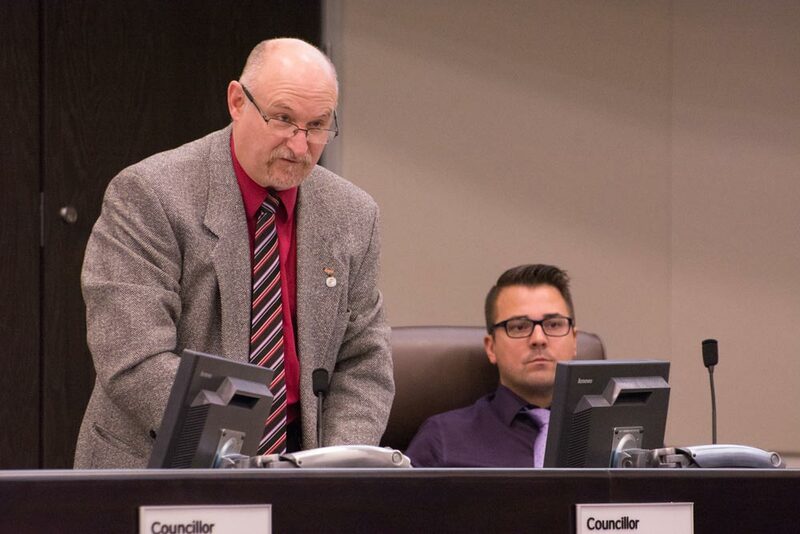 And while several councillors were able to get their digs in for additional support for given causes, Mayor John Henry says that the real discussions will come in January when deliberations begin. “I hope they go through it page by page,” Henry said of his fellow councillors. In previous years, the first proposal has always been slashed down. In 2014, staff proposed a 2.11 per cent increase, only for it to be brought down to 1.44. In 2015, a proposed 2.18 per cent increase was wrangled down to 1.82. And in 2016, staff suggested a 2.94 per cent increase, which council brought down to 2.5 per cent. This year, the increase also takes into account a one per cent increase solely to collect dollars for infrastructure. It was something that was recommended during 2014 budget discussions but never implemented. Staff predict the increase could net an additional $1.272 million. Making up the additional dollars for 2017 are increases to salaries and benefits to the tune of just over $2 million, along with additional debt servicing costs ($1.13 million) and additional reserve contributions ($1.5 million). These increases are offset by savings for utility costs and tax appeals, along with a $557,700 decrease to the corporate contingency. Staff are also predicting a 1.4 per cent increase in taxation revenue due to growth in the city. While the majority of city departments are looking at fairly minimal increases to their budgets, the largest going to community services with a 4.53 per cent increase and development services with a 5.84 per cent increase, the city’s corporate expenditures are seeing a bump of 11 per cent thanks in large part to additional debt of approximately $8.4 million to pay for the city’s new LED street lights. Following their final meeting of the year on Dec. 19, councillors will return to the table on Jan. 10 in a special meeting to hear comments from the public concerning the budget. Deliberations will then begin on Jan. 17, with tentative approval set for Jan. 20 – however, an additional day of deliberations has been set for Jan. 25 if necessary.